The Aymara language is part of the “jaqi” language group. Other languages that belong to this group are the Kawki and Jaqaru, both spoken in Peru. 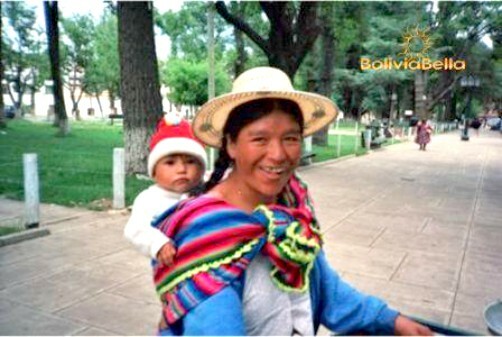 In Bolivia about 25% of the national population speaks this language, one of Bolivia's more than 20 official languages. The majority of people who identify with this native culture live in the Andes region ranging from the North of Lake Titicaca to the Uyuni Salt Flats region, including Oruro Potosí, and Sucre, North of La Paz into the subtropical valleys of the Yungas, and the Southeast into the valleys of Cochabamba, though thousands are migrating each year to tropical Santa Cruz in eastern Bolivia in search of better economic opportunities. The Aymara are the largest ethnic group in Bolivia, numbering about 2 million (20% of Bolivia's population). Most communities are agricultural (and the sales of their products in open markets) and some are involved in cattle ranching. They produce mostly potatoes, corn, quinoa, and various types of tubers and beans. They herd llamas, alpaca, cows, pigs and sheep. They are a hard working people and also very artistic. They are highly skilled at weaving using llama, alpaca vicuña and rabbit fibers tinted with natural dyes; colorful and very intricate basket weaving, pottery, sculpturing and painting. They create the haunting, Andean music with unusual instruments, their dances are all historically based and beautiful, and their Aimara festivals legends and history are all very attractive to tourists. The Aimara are a proud culture and have retained many of their traditions, especially their natural medicines, certain cultural rites, and their native dress to this day. They are perhaps best known for the totora reed boats they fashion for transportation in the Lake Titicaca area. They are a hardy race, having survived centuries of enslavement by the Spanish to become the most populous indigenous group in Bolivia today. With the 1952 Land Reform in Bolivia, during which large sections of land were taken from the wealthy and divided among the poor, and with other social and governmental changes that took place during this decade, the Aimara gained access to national political institutions at the same time that reforms gave them a greater measure of control over their lives. Whole communities gained access to consumer goods, governmental services, and educational opportunities unavailable a generation earlier. The Aymara indians have become a powerful social group, demanding and working hard to ensure changes and improvements to their living conditions, and opportunities for education and health care. 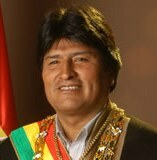 President Juan Evo Morales Aima (pictured here) was elected in December 2005 and re-elected for a second term in 2009. He is Bolivia’s first indigenous president and is of Aymara descent.